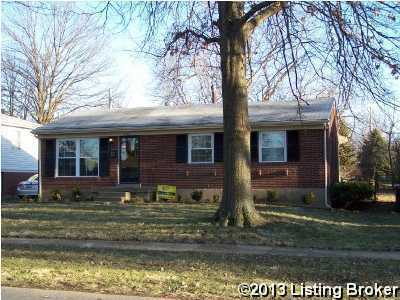 WOW Super nice 3 bedroom 2 full bath home in a great area that does not last long. Enjoy this open floor plan with kitchen and living room all open space as you enter the front door. Very large master bedroom with master bath and walk in closet. Kitchen has new granite counter tops and maple cabinets. Large kitchen island with granite counter top. Built in microwave and dishwasher. Stove and refrig can remain. Outstanding hardwood floors thru out most of this home. Fresh paint thru out. Large 2 car garage with carport. Fenced back yard. Full unfinished basement. HVAC under 1 year old. Updated tilt out replacement windows. You will not want to miss out on this one, ready to go here. 3120 Kaye Lawn Dr, Louisville KY 40220 is a Home, with 3 bedrooms which is recently sold, it has 1,200 sqft, < 1/4 ACRE sized lot, and 2 Car Garage,Detached parking. A comparable Other, has bedrooms and 0 baths, it was built in and is located at and for sale by its owner at $ 0. This home is located in the city of , in zip code , this County Other, it is in the Subdivision, and Stony Brook Woods are nearby neighborhoods.